What is a grain? What is a seed? What are pseudo-cereals? When first going grain-free it can be a challenge to work it out, especially as grains can be hidden in the most unlikely of places. Here is a useful list of what is a grain, and what is NOT a grain. It doesn’t include everything. but covers most commonly known grains and hidden sources of grains. Regularly updated. * some lists consider these as seeds, not grains. Sometimes the argument is purely one of semantics. This includes cakes, biscuits, pizzas, bread, pasta, pastry, boxed bread-crumbs, sauces or custards that use flour to thicken, spaghetti and pasta, lollies and sweets. Pseudocereal is the term used for plants that are not cereal grasses, which have either seeds or fruits which are prepared and eaten like a grain. Pseudocereals are always gluten-free. Although they are technically considered seeds or fruits they are not allowed on Paleo, GAPS, AIP, SCD but are allowed on Body Ecology and some healthcare practitioners do allow them. Amaranth is a grain-like seed, from the broadleaf (dicot) plant family. (OK for Body Ecology, or if tolerated, not paleo or GAPS). Is generally treated as a grain when discussing due to being cooked and used much the same way as cereal grains, but is in class Magnoliopsida, while the cereal grain family Poaceae stems from class Liliopsida. Buckwheat also called Kasha – is a grain-like seed, related to rhubarb, from the broadleaf (dicot) plant family. (OK for Body Ecology, or if tolerated, not paleo or GAPS). Is generally treated as a grain when discussing due to being cooked and used much the same way as cereal grains, but is in class Magnoliopsida, while family Poaceae stems from class Liliopsida. Quinoa is a grain-like seed, from the broadleaf (dicot) plant family. (OK for Body Ecology, or if tolerated, not paleo or GAPS). Is generally treated as a grain when discussing due to being cooked and used much the same way as cereal grains, but is in class Magnoliopsida, while family Poaceae stems from class Liliopsida. The Body Ecology diet says Millet is a pseudo-cereal, a gluten-free grain-like seed. However, it is a member of the plant family Poaceae, of which the other cereal grasses belong and is generally recognized as a grain in most sources I have checked. Because of this, I have listed it on the grey area grain list and it is up to your own research/opinion as to whether you choose to treat it as a grain or not. In reviewing this list, it may be helpful for you to also view the article Not All Seeds are Grains” by herbologist Roy Collins. You may also find the Wikipedia entry for “Food Grain” helpful and my discussion on Pseudo-cereals here. All lentils and pulses are not grains and can be used to make Dal and other lentil based dishes. They can be a great grain-free alternative if you can tolerate them. So anything made from these products would be technically grain-free (but not necessarily ok to consume – for many people they would still cause problems for various reasons). For example, bread, cakes or pasta made from grain-free flours do not contain grains. Reading ingredients is important! Dairy products or anything from an animal like milk, cheese, butter or meat do not contain grains. All fruits and vegetables are not grains, (except for corn, which is a grain). Just because something is “technically” not a grain, doesn’t make it automatically ok. 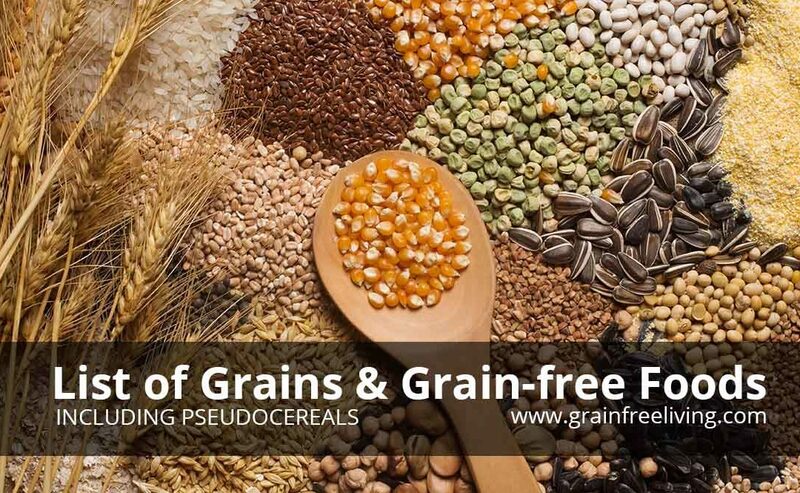 If following Paleo or GAPS, you wouldn’t touch any of the grain-like seeds or most of the starchy grain free alternatives in the above “not a grain list”. So for many, the alternatives are nuts and seeds but not pseudo-cereals. For my family, they do ok on soaked & sprouted quinoa, amaranth, buckwheat, and millet, so I cook them sometimes, although not every day. For myself, I stick to the paleo versions: cassava flour, plantains, sweet potato flour, coconut flour, tapioca and possibly nut and seed flours like almond meal and ground up seeds.